They are herbaceous perennials with upright, much-branched stems on which masses of small daisies are produced in late summer and autumn. The flowers range in colour from white through pale lilac blue, mauve, purple and pink to deep reddish plum. 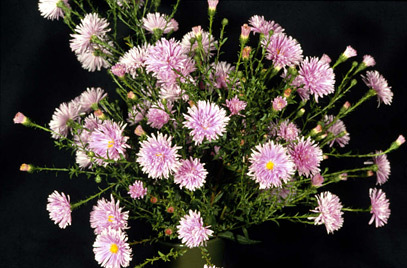 In England these plants were called Michaelmas Daisies because they bloomed at the same time as St Michael's Day was celebrated, 29 September. They could never be called that in Australia as they flower in our Southern Hemisphere Autumn, so instead they are Easter Daisies for us! 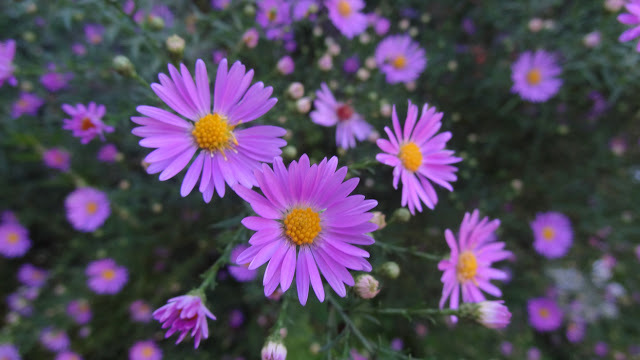 We probably think of them as Asters, but as recently as the 1990s the Family of Asters was split and the Easter Daisy, whilst remaining in the Aster Family was reclassified into the Genus, Symphyotrichum which are recognized as the asters which are native to North America. That which we call an Easter Daisy, by any other name would smell as ...... Now, what does it smell like? 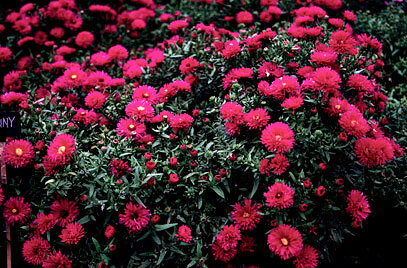 ABC Gardening Australia Series 28 Episode 07 - Easter Special has a segment on the Easter Daisy, presenter Jane Edmanson's profile can be seen here.